Starbucks holiday drinks are now available in stores and Starbucks is celebrating with a special promotion. 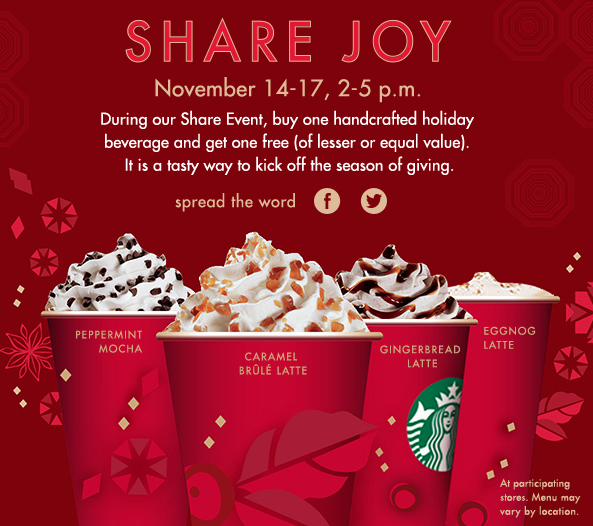 During November 14 – 17 from 2 – 5 pm, if you buy one holiday beverage you can get an equal or lesser value holiday beverage for free. Under this promotion, you can get the peppermint mocha, caramel brûlé latte, gingerbread latte, or eggnog latte (or the frappuccino/iced version of any of these).